Use the same fluid for both the brakes and clutch. 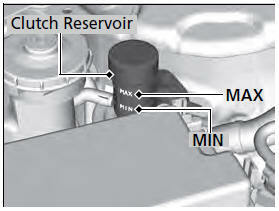 The fluid level should be between the MIN and MAX marks on the side of the reservoir. 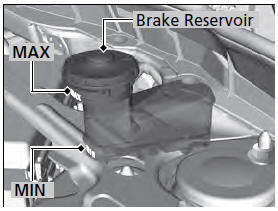 Brake fluid marked DOT 5 is not compatible with your vehicle's braking system and can cause extensive damage. If the specified brake fluid is not available, you should use only DOT 3 or DOT 4 fluid from a sealed container as a temporary replacement. Using any non-Honda brake fluid can cause corrosion and decrease the longevity of the system. Have the brake system flushed and refilled with Honda Heavy Duty Brake Fluid DOT 3 as soon as possible. If the brake fluid level is at or below the MIN mark, have a dealer inspect for leaks or worn brake pads as soon as possible. If the clutch fluid level is at or below the MIN mark, have a dealer inspect for leaks or an excessively worn clutch plate as soon as possible.